I have spent quite a bit of time in Rhode Island, since my favourite aunt lives there, However this was the first couple from Rhode Island whose marriage I officiated. 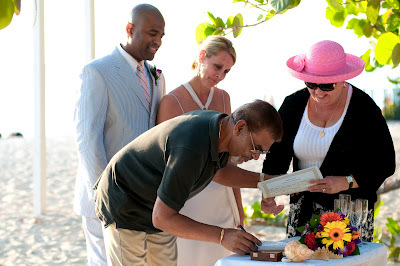 Sometimes you meet people and they seem like family right away, and this is how it was with my husband and I and this couple. 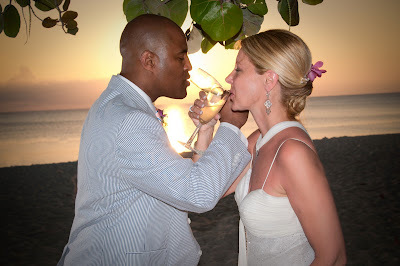 They had gotten engaged on Seven Mile Beach two years ago and they wanted a romantic sunset wedding right here at Governor's Beach. 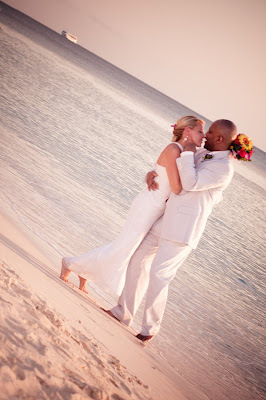 Fortunately the "king" of romantic wedding photo shoots, Luis Vallecillo was available. As you will see, I got quite carried away with these photos, so I have posted more than I usually post. The light was perfect and many photos in their album are black and white or sepia which adds to the ambience of this romantic ocassion. 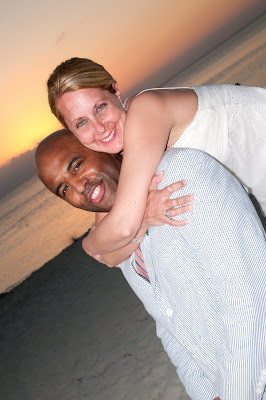 The end (almost) of a perfect wedding day in the Cayman Islands! Ceremony by Joy for Simply Weddings, "tropical flavours" bouquet by Trisha's Roses, photography by Luis Vallecillo.